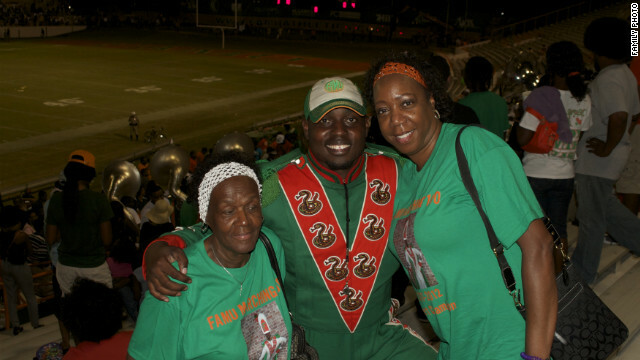 Florida A&M University drum major Robert Champion died in November after a hazing ritual on a band bus. (CNN)–Florida authorities have brought charges against 13 people in what they called the hazing death of Florida A&M University drum major Robert Champion, a prosecutor announced Wednesday. "Robert Champion died as a result of being beaten," State Attorney Lawson Lamar told reporters. "His death is not linked to one sole strike, but is attributed to multiple blows." Champion died after collapsing on a bus that was carrying members of FAMU's Marching 100 back from a football game. Medical examiners ruled his death a homicide, saying he died "within an hour of a hazing incident during which he suffered multiple blunt trauma blows to his body." Some university band members have said the 26-year-old died after taking part in an annual rite of passage called "Crossing Bus C," an initiation process in which pledges attempt to run down the center aisle from the front door of the bus to the back while being punched, kicked and assaulted by senior members.